Kim Chambers and Helen Huntly of the Parkes Painting Group donating a cheque for $1000 to Neil Unger, CDS Chairman. 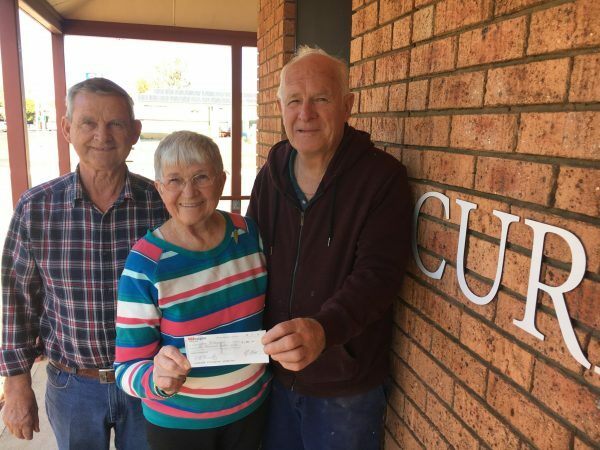 THE Parkes Painting Group have kindly donated $1000 to Currajong Disability Services from their exhibition in late April 2018. Kim Chambers and Helen Huntly, who has grandson Blake at Currajong, were on hand to present the cheque to Currajong Chairman, Neil Unger. “We continue to be overwhelmed and appreciative of the kindness of the Parkes business community,” said Neil. “From the Railway Bowling Club, Parkes Services Club and many more including the Parkes Painting Group. “It is quite unbelievable the amount of donations and generosity we have received in the last 6 months,” he said. With demand on disability services rising 7 to 8% per annum in real terms for the past 20 years and continuing to rise, not to mention a swell of up to an extra 100,000 in the industry (to go with the 50,000 added since the NDIS roll out in NSW over the past year) means every little dollar counts. “Services will be at a premium as demand grows and we, like other organisations, need to purchase new equipment, maintain current resources and infrastructure as well as add to our existing services,” said Neil. “So this kind donation can’t be overstated enough.